Sender Policy Framework (SPF) has been around for a while, but recently we’ve seen email providers getting much more active in using it to filter mail. Most notably, Gmail appearing to be flagging mail from all domains without an SPF record as untrusted. In a nutshell, SPF allows you to publish a DNS record that declares a list of all of the mail servers that may legitimately send mail from your domain. It’s not perfect, but it’s a useful tool in reducing email with a forged sender address. 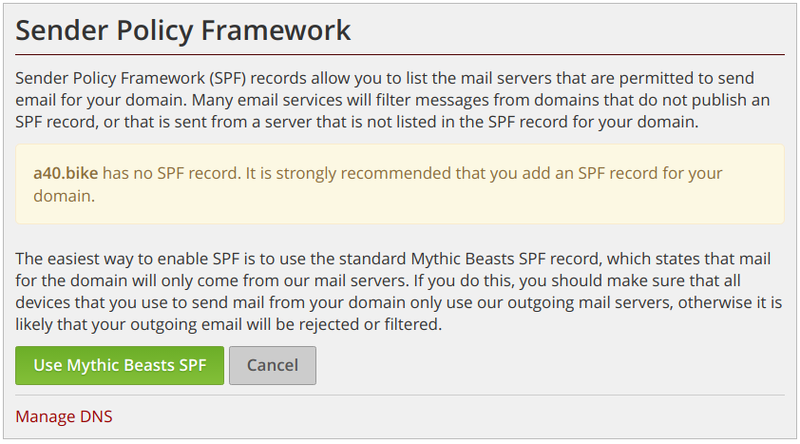 Getting SPF records right can be a bit tricky, but for domains hosted with Mythic Beasts that send mail exclusively via our mail servers, you can now add the correct SPF record with a single click. The SPF settings are available on the domain pages in our control panel. We’d love to make it even easier and just add the record for you, but we can’t be sure that customers are only using our mail servers to send mail, and if not, adding the record will make things worse, although we are planning to add this record by default for newly hosted domains. It’s worth noting that SPF does not cause problems when sending mail via mailing lists as all decent mailing list software will use its own sender address rather than yours. You may be aware of a change made by Yahoo! that caused considerable problems for mailing lists, but this was related to another system, DMARC, which builds on top of SPF. SPF on its own works just fine with mailing lists.